Samsung users rejoice: The Nougat roll out continues to their most recent generation of phones and thanks to a tip from Pete L, we know that the S7 Edge is getting it now. The Nougat update brings a host of new features, performance improvements and a generally better user experience to devices so if you’re sporting an S7 Edge check if you’ve got an update waiting for you now because you won’t be disappointed. Having seen the update drop for other devices you can also expect that there will be some Touchwiz tweaks to look forward to that will improve the performance and usability of your device. Ive got s7 latist software. M having problem with 5ghz wifi conection. “IMS Service has stopped” and “com.sec.edpg has stopped” are pooping nostop and I can’t do anything on my S7 edge. The screen is frozen and unresponsive to anything even to power off or restart until it already drained my battery. What do I do? So far no issues on my S7 edge after update today, is you S7 edge telco branded or unbranded? Optus Australia, update worked fine since the day it was released in Australia until today. My wife’s Telstra branded S7 just got the update. I seem to be having major wifi issues on nougat – anyone else having problems? I saw it on my update page yesterday but didn’t download as I was on mobile data. Check again today and it’s disappeared… WTF?!?!? yeh my wifes phone cant get it any more either. i guess they pulled the update due to it killing some peoples phones. I guess that means they’re admitting theres an issue finally rather than blaming the users. I have a Samsung S7 Edge and got the update 2 days ago and it’s pretty good so far. Quite different looking in the functionality of some areas like messages and settings. It also tells me what programs have been ‘put to sleep’ in the background so the phone runs more efficiently which i was surprised and liked. Im still getting used to it and all the different features. J! Hi I have an s7 edge with telstra and I have not received the new update yet. Is there anything I can do to make it happen? Confirming the update is available for the S7 (non Edge) too. I just want to reiterate that this is a major version update, not just some incremental bug fix – it’s in your best interest to install the update then do a factory reset to remove any residual files that may cause your phone to have issues or be sluggish. If you’ve backed up everything (considering it does it automatically once set up, why wouldn’t you?!) then you will be almost back to where you left off before the reset (apart from some settings, having to login to apps etc). Any ideas when we can expect it for the non-edge S7? A colleague said his S7 received it yesterday. Still waiting for mine (telstra) which is funny because my best friend is a Samsung rep and she said it should have been pushed to all by now. Oooo pls tell your friend to tell Samsung to bring back the option of using 3rd party fonts!! I hate the fonts they’re forcing us to use!! Thank you so much Daniel. It worked!!! Very happy now. Thanks for posting your solution. Optus users!! You need to turn on VoLTE to fix that damned Ims service has stopped error. Samsung tech support couldnt even help me with that, i discovered the fix by accident. They tried to tell me i interrupted the upgrade process. So glad to see its not just me. 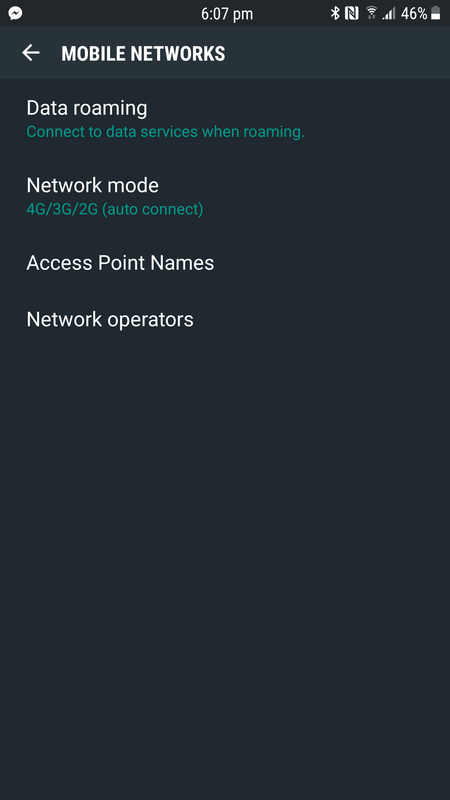 Go into settings -> connections -> mobile networks. Can confirm 🙂 Running like a dream and still providing 6+ hours screen on time. I downloaded last night. I’m also getting message ims service has stopped. My phone is terrible. Freezing all the time. Only does this with Optus sim card. Works very well with Telstra sim. I’ve read it’s something to do with backing up messages but I can’t find any setting to stop this. I wish I hadn’t done the update. Do a factory reset. Assuming you have backed up your phone, you will almost be back to where you left off beforehand but everything will run smooth again. OK fair enough. Lift your game Samsung! I could never understand why some of the best settings or features are switched off by default. I just checked, and it’s now downloading on my S7 bought outright (not on contract). Also have double tap on my G5 , a nice little feature . This was available to the Note 7.